Gabrielle “Gabs” Lucero ’17 has won the National Association for Law Placement (NALP) Pro Bono Publico Award for her extensive pro bono work and service. At Duke Law, Lucero is co-leader of both the Veterans Assistance Project and the Coalition Against Gendered Violence project. She also serves as cadet battalion commander for the Duke Army ROTC Blue Devil Eagle Battalion. Lucero was one of 10 finalists for the award, which recognizes dedication to public interest organizations and projects and the impact of that work on the community at large. In addition to her work on these projects, Lucero volunteers regularly for the Durham Crisis Response Center and coaches a youth basketball team at the YMCA. 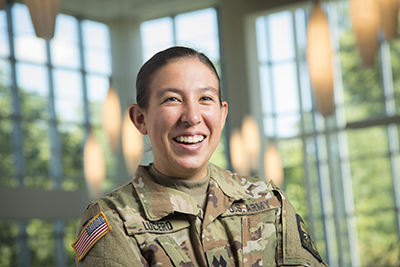 She will graduate next May with a Master’s in Public Policy in addition to her JD, after which she plans to begin a career in the Army JAG Corps.